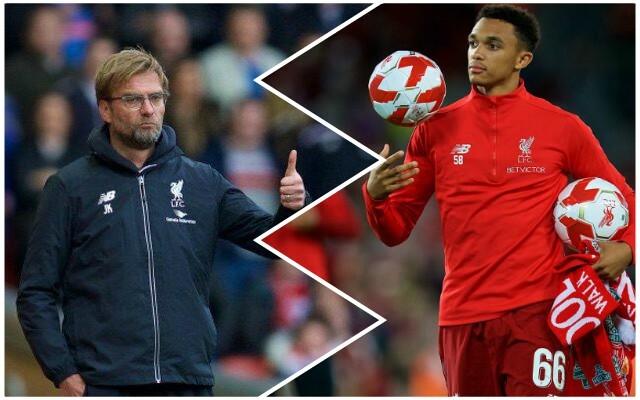 Jurgen Klopp says Liverpool full-back Trent Alexander-Arnold could be back in time for the visit of Leicester City on Wednesday. The Scouser injured himself during the game against Brighton and has been missing since then, absent for the 4-3 win over Crystal Palace. Klopp told LiverpoolFC.com: “He is better, much better, but we have to see. It needs to be stable – and in the moment it is stable and it’s about the pain. “Everyone knows how desperate Trent is to play; he can ignore pretty much everything. That he played that game at Brighton was sensational, to be honest. Fabinho is expected to be back fit again and could have slotted in at right-back, the position he plays for Brazil, with James Milner suspended, but if Trent is back for Leicester, it would mean the number three can play in midfield, his best position. Keeping as many players fit as possible in the title run-in will be crucial, and it seems having a break due to FA Cup action has worked in the Reds’ favour. Getting players back fit again, as well as resting those like Mo Salah and Sadio Mane, who have played a lot of football recently, is so important at this stage of the season.